Emfit QS vs. Oura Ring - which is more accurate? Other than that, the stages were somewhat aligned, though nothing like in the polysomnography comparison that the Oura team produced (which could mean that the Emfit just isn't that accurate). 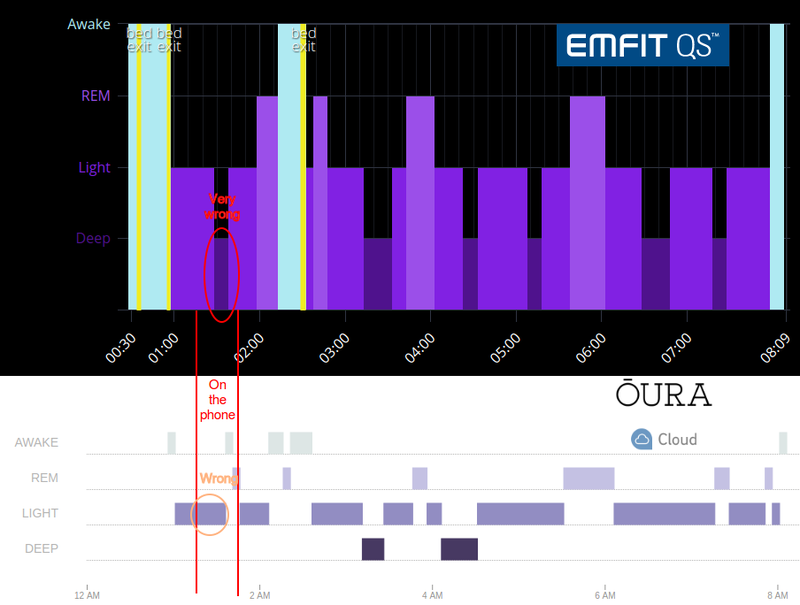 Also, the Emfit QS seems to over-detect deep sleep. I was hoping that the Oura Ring would under-detect deep sleep, but given that a phone call was read as "deep sleep" by the Emfit and light sleep by the ring, that's likely not the case. More on my blog - "Which is the more accurate sleep tracker - Emfit QS or Oura Ring?". Has anyone used other sleep monitors that had better accuracy (except the discontinued Zeo)? We have a Resmed S+ sleep tracker hanging around the office here in Berkeley if you want to compare this one - I'd be interested in what you find out. Hey, does your Resmed show you actual graphs of ambient noise + temperature correlated with sleep activity (motion, restlessness, breath, etc.)? I'm trying to figure out if elevated light and temp levels early morning are causing me to wake up (way too) early, but if all the app gives you is some "sleep depth" graph, and I can't actually see a plot of the temp and light data, it's not very useful. Hi there. Im very interested in what your current findings have been on the emfit qs VS the Oura ring. Im interested in one of these for tracking sleep, and want the most accurate one possible. I do appreciate the easier userface and app content for the ring, and wouldnt mond a smart alarm feature. But at the end of the day I need whichever is the best atm. I'd like to wait for the new Oura Ring and test it vs. the old ring on my other hand. I was surprised by how often and how much QS and Oura differed on the recorded deep sleep. Both claim "sleep lab grade precision" but one had to be blatantly wrong. If the new vs. old Oura ring also give vastly different results, that would be pretty funny (and sad). Thank you for your response. I dont sleep with a partner atm so im not worried about that. I can imagine the differences between the emfit qs and the oura ring to be due to the fact that one is a wearable on your finger. I cant imagine how a ring of that size, just on your finger, is able to track movements for your entire body. The emfit qs to me would definitely represent the more accurate tracker if that is the case. I do not think the newer ring will have night and day accuracy differences to the old one, and im not interested in tracking throughout the day anyway. However, in your personal opinion, would you say the oura ring feels more accurate? Is the Second Generation Oura ring any more accurate? I've been wearing both the old and the new Oura rings on each hand at night, for about a month (since Oct 12, skipping some days). The two rings generally agree on the bed start and stop time, but I also only put them on during sleep, so it's not that hard to detect the transition from no finger to finger. They also mostly agree on deep sleep duration, but on several occasions one indicated twice as much sleep as the other. (If there's interest, I can plot the data). It's well established that not remembering wakeups is quite common. 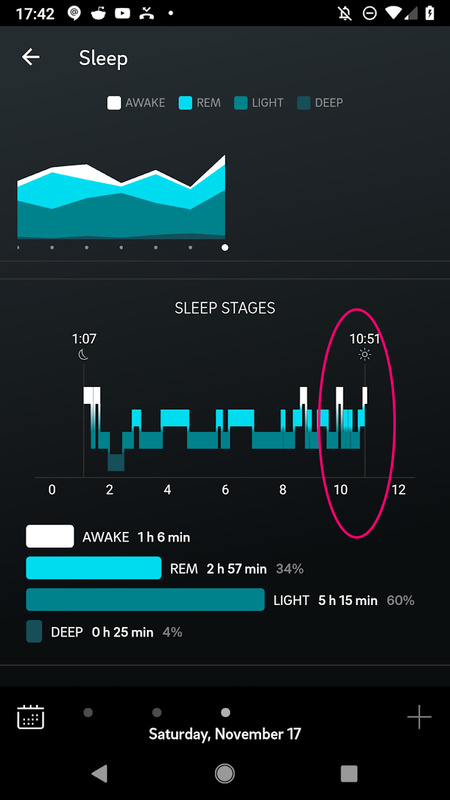 That incorrect sleep detection is about 90 minutes off. Can you really trust that the device would accurately detect you waking up for a few minutes due to sleep apnea, or something else bothering you, if you fall back asleep quickly and have no recollection of it? I've raised this problem with the Oura team and they've acknowledged it, and said that deep sleep detection is a lot more reliable. I would have to trust them on that, but the two rings showing double/half deep sleep on some nights doesn't give me much confidence. basing your day on what the ring says about your "Readiness"
In the end, after ~5 years of sleep tracking with the QS Emfit, Beddit, Oura Gen 1 and Oura Gen 2 and a bunch of phone apps, all I can say in my case is that, for me the best sleep is 7+ hours, solo, on a consistent schedule (same sleep and wakeup times), and with earplugs. Cold vs. warm, dark vs. light bedroom, didn't make much of a difference for me (I know they do for others). So did I really need a fancy sleep monitor to figure that out? The best judges have been my performance at the gym, and ability to focus. Also, the effects of bad sleep can be delayed by one or more days, so I can have a crappy night of sleep and still perform well, if I've had good sleep the few nights before. Likewise, after a good night's sleep, I can yawn all day and feel tired (probably because I had bad sleep some nights before that). This complicates drawing correlations, and sleep monitors further confuse the problem when they display readings like "High readiness, see how far you can push yourself today". Having a record of nothing more than when you went to bed and when you got up can still be valuable, e.g. to keep an eye on how regular your sleep schedule is, or to provide some context to other data like heart rate or blood sugar measurements. Sure, but you don't need a $300 - $1000 ring for that. Worse, the ring can confuse things. Last night I wore the two again, and one reported a sleep start time one hour later than the other, and half the deep sleep. Agreed; I currently keeping track of my sleep times by pressing the button on an old Fitbit One that refuses to die (or be lost...) when I go to bed and when I get up... It's less tedious than having to open an app to start/stop tracking, and much less tedious than having to review and correct auto-detected sleep periods every day!